Stephen ("Stevie") Ray Vaughan, born in Dallas, Texas (October 3, 1954 ? August 27, 1990) was an American blues guitar legend, and is known as one of the most influential blues musicians in history. Stevie Ray had been in numerous bands before joining blues rock combo Stevie Ray Vaughan and Double Trouble in the late 1970's. Stevie Ray Vaughan and Double Trouble's debut album was released in 1983. The critically acclaimed Texas Flood (1983) featured the top-20 hit Pride And Joy and sold well in both blues and rock circles. Stevie Ray had been in numerous bands before joining blues rock combo Stevie Ray Vaughan and Double Trouble in the late 1970's. Stevie Ray Vaughan and Double Trouble's debut album was released in 1983. The critically acclaimed Texas Flood (1983) featured the top-20 hit Pride And Joy and sold well in both blues and rock circles. 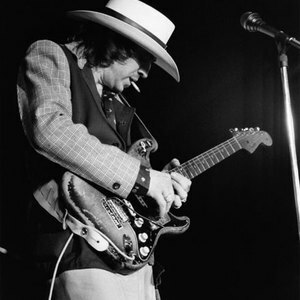 Stevie Ray Vaughan died August 27th, 1990 when his helicopter crashed into the Alpine Valley ski hill. He was on his way back from playing a guest appearance at an Eric Clapton concert at Alpine Valley Music Theatre in East Troy, Wisconsin. Vaughan's first recording band was called Paul Ray and the Cobras. They played at clubs and bars in Austin during the mid-1970s, and released one single. Vaughan later recorded two other singles under the band name The Cobras. Stevie left the Cobras, leaving Denny Freeman still in his role of original lead guitarist, and formed Triple Threat in late 1975, which included bassist Jackie Newhouse, drummer Chris Layton, vocalist Lou Ann Barton, and sax player Johnny Reno. Barton left the band in 1978 to pursue a solo career, followed by Reno in 1979. The three remaining members started performing under the name Double Trouble, inspired by an Otis Rush song of the same name. Vaughan became the band's lead singer. Tommy Shannon, the bass player on Johnny Winter's early albums, replaced Newhouse in 1981. A popular Austin act, Vaughan soon attracted the attention of musicians David Bowie and Jackson Browne. Both Browne and Bowie first caught Vaughan at the 1982 Montreux Jazz Festival, where some members of the audience booed the band because they disliked Double Trouble's hard blues sound; the crowd response was quite different when they were subsequently invited to headline "Blues Night" at the festival in 1985. In November, 1982, Vaughan recorded in Jackson Browne's studio in downtown Los Angeles. The recordings were brought to the attention of A&R man John Hammond and became Double Trouble's critically acclaimed first album, Texas Flood (1983), produced by Hammond; it featured the Top 20 hit "Pride and Joy" and sold 500,000 copies, earning the band a gold record. The album was nominated for a Grammy Award, and its song "Rude Mood" was nominated for "Best Rock Instrumental". Vaughan won three categories in Guitar Player's readers poll: "Best New Talent", "Best Blues Album", and "Best Electric Blues Guitarist". He became the second guitarist to win three Guitar Player awards in one year (the first is Jeff Beck). Vaughan won the "Best Electric Blues Guitarist" award every year until 1991. Also in 1983 Bowie featured Vaughan on his 1983 album Let's Dance. Vaughan was asked to go on tour with Bowie, but declined so he could continue to play with Double Trouble. Reportedly, Vaughan, who was still driving a delivery truck to support himself, was furious when he saw Bowie pantomiming over Vaughan's guitar solo in the video for "Let's Dance". The band's next album, Couldn't Stand the Weather, was recorded in January 1984. During mid-1984 Vaughan and Double Trouble made numerous TV appearances, performing on Rockpalast, MuchMusic, and Solid Gold. During the Grammy Awards of 1984, Vaughan and George Thorogood presented Chuck Berry with a lifetime achievement award. "Voodoo Child (Slight Return)" from Couldn't Stand The Weather was nominated for "Best Rock Instrumental Performance". The band played Carnegie Hall in New York City on October 4, 1984. The show featured one Double Trouble set, and a second with guests Dr. John on keyboards, George Rains on drums, Jimmie Vaughan on guitar, Roomful of Blues Horns, and singer Angela Strehli. The group rehearsed in September 1984 at the Caravan of Dreams in Fort Worth, Texas. In November, Vaughan won two W.C. Handy National Blues Awards: "Entertainer of the Year" and "Blues Instrumentalist of the Year". It was the first time a white person won either award. During this time, he also began recording with one of his earliest idols, blues-rock guitar pioneer Lonnie Mack, to produce the album Strike Like Lightning on the Alligator label. In late January 1985, the band went on a six-night Japanese tour with various interviews and performances. In March, the band started to produce their third album Soul to Soul. Reese Wynans, a former keyboardist with Captain Beyond and Delbert McClinton's band, was added to the band not long after. The album's production lasted for two months. On April 10 Vaughan played "The Star Spangled Banner" for opening day of the National League baseball season at the Houston Astrodome (supposedly he didn't get a good audience response from that crowd; he did, at least, get to meet former New York Yankee great Mickey Mantle afterwards). Soul to Soul was released on September 30, 1985; Vaughan received his fifth Grammy nomination: "Best Rock Instrumental Performance" for one of its songs, "Say What!". In the following months of 1986, Vaughan and Double Trouble went on tour in New Zealand. It was around this time that he met Janna Lapidus, a touring model in New Zealand. In mid-1986, the band was considering ideas of a new album, particularly a live album. Shows were set up at the Austin Opera House and at the Dallas Starfest. Audiences saw Vaughan struggle through these shows, as some of the original recordings were filled with technical difficulties. On August 27, 1986, the Vaughan brothers' father, Big Jim, passed away of heart failure. A funeral was arranged two days later. The boys rushed home to comfort their mother, yet had little time to mourn. After the funeral was finished, a jet rushed Vaughan to Montreal, Quebec, where he played the "Labatt Blues Fest" (in Quebec, so named for their flagship beer "Labatt Blue"), known elsewhere as the "Miller Beer Festival" in Jarry Park. The recordings in both Dallas and Austin, as well as the Montreux Jazz Festival, were edited and later released on Live Alive in November 1986.